Stephen Paddock seems to have had a parental role model for violent criminality. There was indeed in the 1960s and early 1970s a bank robber, an escaped federal prisoner, and eventually a fugitive by that name (and others) who made the Most Wanted list. 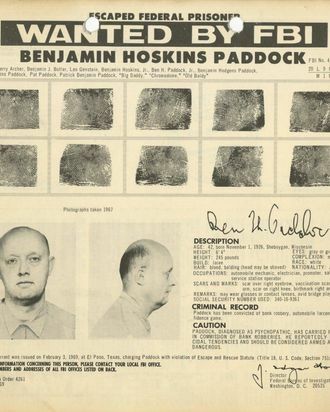 According to the New York Daily News, Patrick Benjamin Paddock was arrested early in 1961 for robbing a bank in Phoenix in 1960 (he allegedly robbed other banks but was not charged with those offenses) while living in Tucson with his four children. He was caught trying to escape from jail in–sigh–Las Vegas, and was sent away, before successfully escaping late in 1968, which put him on the Most Wantedlist. The sins of the father should not, of course, be visited upon the son, but this new intel on Stephen Paddock’s family history is obviously as germane to the mystery of his savage outbreak as any random speculation or ISIS claims. It seems he was 8 when his father was convicted of armed robbery and sent to prison; 15 when the old man escaped and went on the lam; and 26 when he was re-apprehended. We don’t know exactly where Stephen was at each juncture of “Chromedome’s” criminal career, but it’s the sort of thing that could mess you up and perhaps give you an exposure to weaponry.